We are Users of the Anatomy in Clay® Learning System, a Creation of Zahourek Systems, Inc.
Dr. Joe Muscolino is now conducting Anatomy in Clay® Workshops using the original Pro model Maniken® Skeletons by Zahourek Systems, Inc.
Two people to each skeleton so everyone gets to make every muscle; and a maximum of 14 people to each workshop for maximum personal attention. 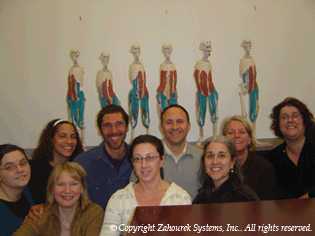 If you would like an Anatomy in Clay® workshop set up for your group, please contact Dr. Joe Muscolino. Learning muscles with clay is the ultimate kinesthetic experience! Dr. Joe Muscolino is presenting this 8-hour workshop for learning muscles by building them in clay, which is the ultimate kinesthetic experience for deepening the knowledge of the skeletal muscles of pelvic tilt. We begin with a brief 1-hour review of the muscles of anterior and posterior tilt, as well as the muscles of lateral tilt (pelvic depression and elevation). We also look at the larger picture of the kinesiology of the region, discussing the relationship between pelvic tilts and spinal postures and motion of the thighs, applying these concepts to musculoskeletal conditions of the area. We then spend the entire rest of the workshop building the muscles of pelvic tilt in clay and applying them to the skeleton, with an emphasis on mover and antagonist muscle groups of each action. 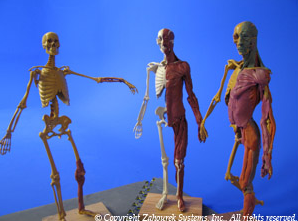 Only Pro models Zahourek Maniken® Anatomy in Clay® Skeletons are used. There are two students per skeleton, so everyone has the opportunity to make every muscle, and workshops are kept to 14 people for maximal personal supervision by Joe. 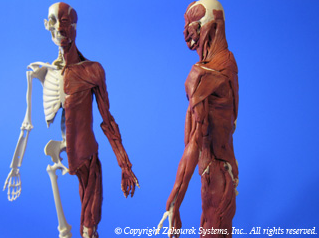 Dr. Joe Muscolino is presenting this 8-hour workshop for learning muscles by building them in clay, which is the ultimate kinesthetic experience for deepening the knowledge of the skeletal muscles of the neck and shoulder girdle. We begin with a brief 1-hour review of the muscles and kinesiology of the neck and shoulder girdle region, with clinical applications to musculoskeletal conditions that occur with muscular imbalances. We then spend the entire rest of the workshop building the muscles of this region in clay and applying them to the skeleton, with an emphasis on mover and antagonist muscle groups of each action. MANIKEN® is a trademark or registered trademark of Zahourek Systems, Inc. or affiliates in the US or other countries. Authorization for limited trademark use limited by Zahourek Systems, Inc., a sole provider of Anatomy in Clay® Learning System. www.anatomyinclay.com.